Okay, enough of the buffalo. I ate it almost every day, since I have been out of buffalo meat for a month or so. I ate steaks on Monday, a roast on Tuesday, roast chopped up in pilaf on Wednesday (and several other days for lunch), the kebabs, and the pot roast. My freezer is full. I am finally buffaloed-out…so, let us eat cake! And what a lovely cake this is. The original recipe came from Have Your Cake and Eat It, Too, a wonderful cookbook with many decadent and delicious recipes. In fact, being the sweet lover that I am, I just ordered her next book. This is not a birthday-type cake, although far be it from me to dictate what sort of goodie you wish to have at your celebrations. Rather, it is a sit down, put your feet up, have-a-warm-slice-with-a-nice-hot-cup-of-tea cake. It is moist with a vaguely tropical flavor. It is delightful warm – I have heated a slice in the microwave and it was as good as fresh. It also packed well in my lunch to be eaten cold, since it isn’t a very crumbly cake. Position a rack in the middle of the oven. Preheat oven to 350 F. Coat an 8 x 12 inch cake pan with cooking spray. Put a little flour in the pan, shake it around to coat the pan, and tap out the excess flour. Put the applesauce, oil, egg, egg white and vanilla into a large bowl and whisk them together until well combined. Mix in the sugar. In a small bowl, whisk together the flours, baking soda, salt, cinnamon and nutmeg. Using a strainer or sifter, sift the dry ingredients over the egg mixture. Stir well to combine; the mixture will be stiff. Stir in the pineapple with its juice and the mashed banana, and mix well. (I actually didn’t have crushed pineapple, so I tossed 1/2 a can of pineapple rings, including the juice, into the food processor and whirled them until they were crushed. Then I threw in the bananas, which were extremely ripe, so that I could add the fruit to the batter all at once). Pour the batter into the prepared pan. Bake for 45-55 minutes, until the cake is springy to the touch or a cake tester (toothpick) inserted near the center comes out clean. Remove from the oven and cool the pan on a wire rack for 10 minutes. Sift confectioners sugar over the top if you are using it. (I’m not a big confectioners sugar fan, but it is pretty that way.). Cut in squares. Makes 12 servings at 1.5 grams of fat/serving, or if you want a bigger piece, 8 servings at 2.25 grams of fat/serving. Variations: Use 1 1/2 cups of all-purpose flour if you don’t have whole wheat pastry flour on hand. In order to have specialty flours like whole wheat pastry flour or corn flour on hand when I need them, I put them in a re-sealable plastic bag and put them in the freezer so they don’t turn rancid. Hint: When I lower the fat in baked goods, I usually substitute unsweetened applesauce for part of the oil (Don’t substitute for all of the oil. I have tried it and the baked goods seemed tough). But it seems like a waste to open a whole jar of applesauce for three tablespoons, unless you plan to eat the rest of it fairly soon. So I use those little single serving size containers. One of them usually is good for 2-3 baking sessions. They cost more initially, but it beats having a whole jar of applesauce spoil when it gets lost in the back of the refrigerator. And what is that gooey white stuff on top of the cake? You are right, my dears, it is light whipped cream, the kind from a can that you used to squirt directly into your mouth when your mother wasn’t looking. I discovered that 1 serving of whipped cream has 1 gram of fat. A serving is 2 tablespoons, but I think that would be very difficult to measure. A serving is also 6 grams, so I weighed it. 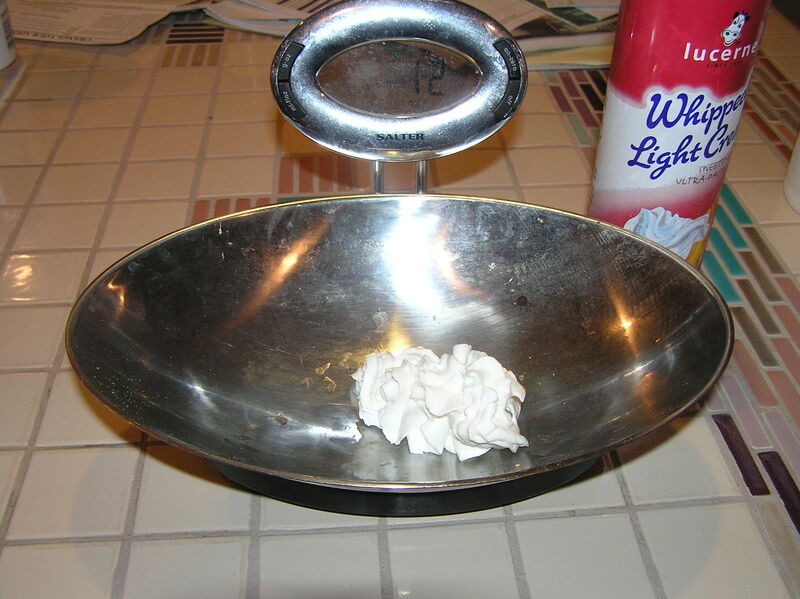 Slightly flour-covered scale with whipped cream. 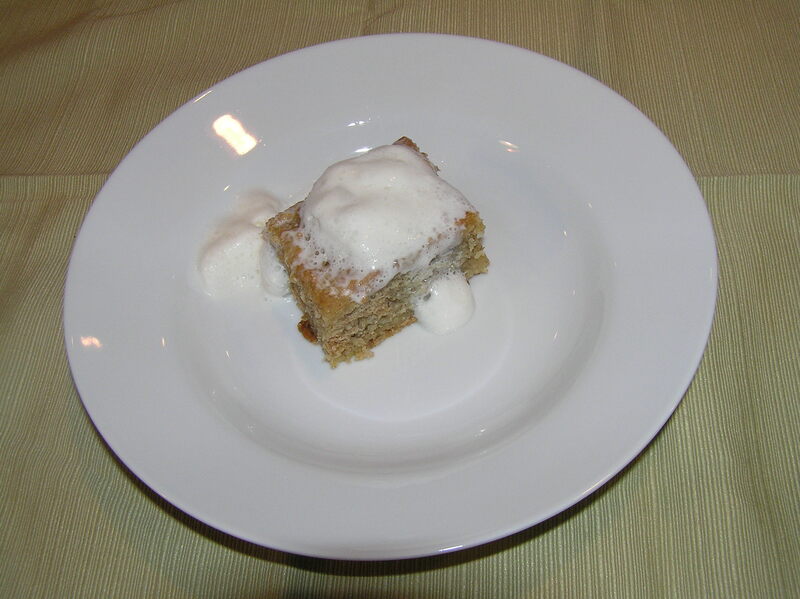 With 12 grams of canned whipped cream on top of my warm pineapple-banana cake, I had an indulgent 4 gram evening snack to go with my peach tea.